Everything Dinosaurs: Chomp on Tons of Earthshaking Facts and Fun by Blake Hoena. Review: Carnivores rampaging herbivores; dinosaurs doing what they have to in order to survive. Learn about all of this and more when you read Everything Dinosaurs by Blake Hoena. Everything Dinosaurs teaches you about some dinosaur superstars such as the Microraptor. It also looks into different ages which build off of larger periods of time. For example, the Jurassic Period is in the Mesozoic Era. Readers will also learn who, who dug them up. In addition, Everything Dinosaurs will also teach you about fossils and archaeology. For instance, you will learn about types of fossils, who, and how they dig them up! This book can be for anyone, but mostly younger kids. The book is also very factual and I recommend Everything Dinosaurs to people who like dinosaurs and archaeology. It's perfect for anyone who likes to learn about the past, through logical or factual books! 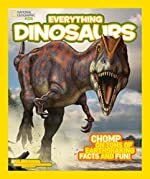 We would like to thank National Geographic for providing a copy of Everything Dinosaurs: Chomp on Tons of Earthshaking Facts and Fun for this review. Have you read Everything Dinosaurs: Chomp on Tons of Earthshaking Facts and Fun? How would you rate it?